The Motorist Assistance Program (M.A.P.) is a service of University Parking, a division of the Department of Public Safety. M.A.P. 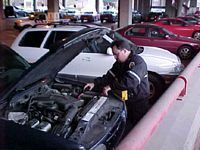 is designed to assist students, faculty, staff and visitors experiencing minor vehicle problems while at the university. To request the Motorist Assistance Program, contact University parking at 852-PARK, 24 hours a day, 7 days a week. Services provided include jump starting a battery, unlocking a car door, airing a flat tire or loaning a gas can.